Tiger Scout Zachary Hearon looked over his grandfather’s Scouting memorabilia displayed at his pack’s blue and gold banquet. He was fascinated with the Eagle Scout award. His grandfather, Russell Hayes, earned his Eagle in 1965 while a member of Explorer Post 44 in Millville, New Jersey. He remained active in Scouting for decades, and his daughters became Cub Scout leaders. For this blue and gold, Zachary’s pack celebrated Scouting’s Centenary by asking family members to show off their collections. A decade later, Hayes and Hearon attended another Scouting ceremony: Zachary’s Eagle Scout court of honor. To honor his achievement, Hayes pinned his Eagle award that Hearon had admired years before on his grandson. “To watch him go through Scouting was an honor for me,” Hayes says. 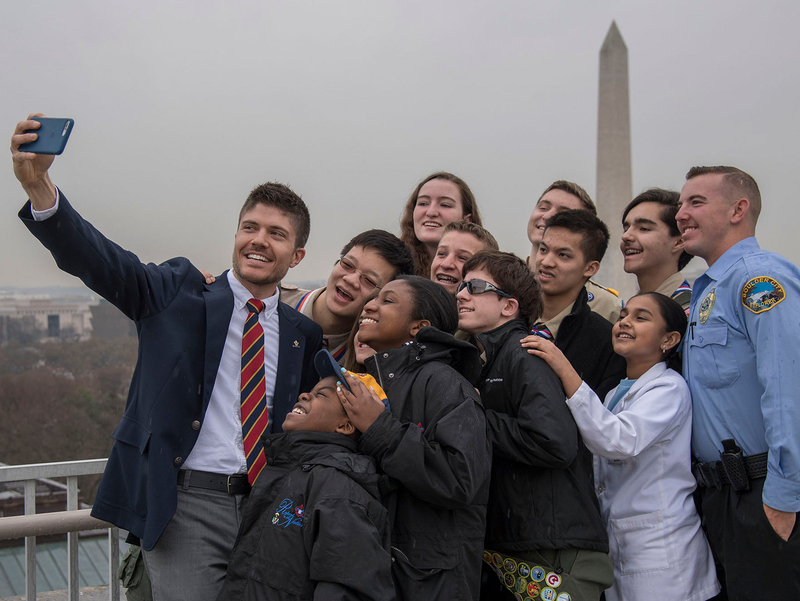 Sharing your Eagle award with a family member who has also reached the pinnacle of Boy Scout ranks isn’t a common practice, says Ryan Larson, National Eagle Scout Association associate director. It’s permissible as long as the award is BSA-issued. It’s also a special, heartfelt way to welcome a new member to the Eagle Scout brotherhood. Eagle Scouts sometimes soar within families. Those who do can be featured in Eagles’ Call, the official magazine for Eagle Scouts. Siblings and/or generations who have earned Eagle can submit photos that you could see on the quarterly magazine’s pages. Eagles’ Call also highlights Eagles who are serving in our armed forces, have recently received outstanding recognitions or who have passed away. Please submit entries via online form, email or mail. Reaching the Eagle Scout rank isn’t the only way Hearon is following in his grandfather’s footsteps. After earning his Eagle, Hayes volunteered as a Scoutmaster, committee member and assistant district commissioner. “He’s going to stay with the troop,” Hayes says of his grandson. A member of Troop 1065 in Cape May Court House, New Jersey, Zachary also serves as a peer leader in school and was inducted into the National Honor Society. He is also interested in pursuing engineering as a profession. Hayes is a retired mechanical engineer. “He’s taking after me in that, too,” Hayes says.